The Cord 810 Could Be Had in Both FWD and RWD. One iconic body, three manufacturers and two different drive axles. Outside of mid-engine racing homologations, I can’t think of a single other car available in such disparate configurations, or under more desperate circumstances. The Cord 810 splashed onto the scene in late 1935 with its stunning Beuhrig body and futuristic front wheel drive, shown below. Quite oddly, the preselector transaxle sat in front of the 288 cubic engine Lycoming engine while axle shafts passed through holes in the frame rails. Unfortunately, the Cord 810 was, put kindly, something short of a runaway success. 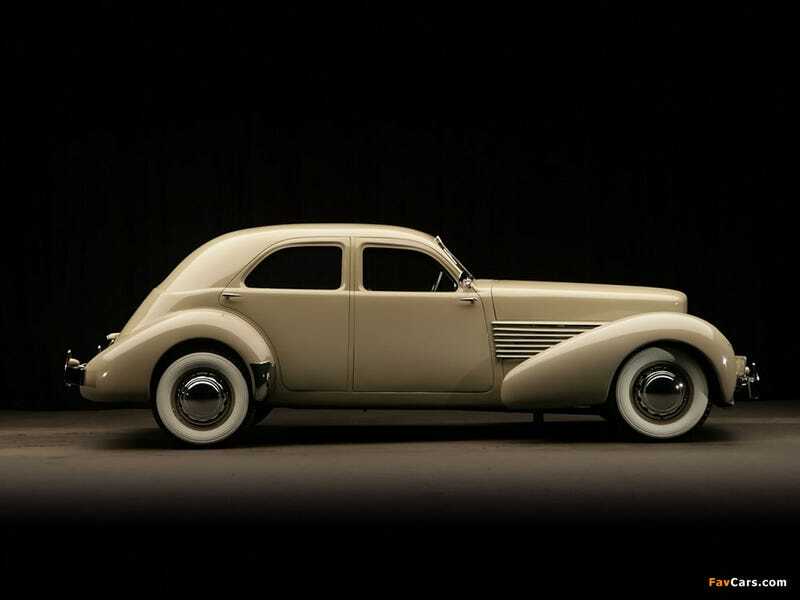 After selling a few thousand rather unreliable examples over only two model years, Indiana-based Auburn sold its body tooling to struggling Hupmobile in Detroit. Hupp’s production was shut down at the time due to money, so the company ironically lacked necessary funds to produce the cars. This was no doubt due in part to the fact that each roof was stamped in seven separate pieces, then welded and filled by hand. Still, with such an advanced design, the car was still deemed worth building and Hupp was able to build a few prototypes to drum up orders. Soon, Graham-Paige from Evansville, IN stepped in. The proud-but-broke manufacturer had often been forced to contract Continental to produce engines which had been designed in-house, and had even raised a few dollars by selling old production equipment and rights for its outdated Crusader to Nissan (yes, seriously). Graham was reeling from a make-or-break model update that nearly put the company under; it and Hupmobile came to a potentially lucrative agreement- Graham would build cars with Hupp’s equipment. After a lengthy nine-month delay, they made it work and Graham started production on the streamlined 1940 Hollywood. Using its own 217ci inline six engine, the Hollywood employed a conventional three speed manual transmission and live rear axle instead of Cord’s FWD V8 setup, accomodations for which contributed to the early production delays. On the bright side, the Hollywood followed Cord’s lead in offering a supercharger. This bumped brake horsepower from 98 up to a formidable 120, both figures besting Ford’s flathead V8. The supercharged Lycoming V8 with 60 more cubic inches put out 125. Holding up its end of the deal, Graham also produced the Skylark with a 245ci inline six Hupp engine and a handful more horsepower than the naturally aspirated Hollywood. The cars were not successes, though, and fewer than 2,000 Graham Hollywoods of this generation were sold. Hupmobile moved merely 319 examples. However, the greater story is quite remarkable and I recommend reading further. There you have it. One body, three cars. Front wheel drive or rear wheel drive- take your pick!